365 Church By Menkes Developments Ltd.
365 Church Condominium presented by Menkes in the location of Church and Carlton.Street. It is a 30-storey mixed use building comprised of a 3-storey podium and 27-storey tower. The tower is right on the north east corner of Church and McGill Street. 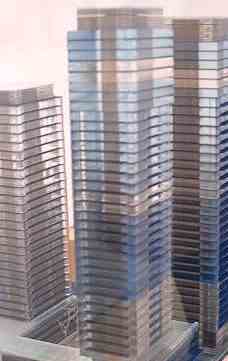 The luxury tower consists of 322 units and 3 townhomes. The complex includes 5 levels of below grade parking with 161 parking spaces and 225 bicycle parking space.Imagine an urban address filled with light and air. With restaurants, bistros, clubs, cafe's, and cinemas all at your doorstep. Merely steps to Maple Leaf Garden, the upcoming Loblaws supermarket and Ryerson University. Minutes to College subway station. Close to everywhere you love about the City. 365 Church offers a complete range of suites, including Studio, 1 Bedroom, 1 Bedroom + Den, 2 Bedrooms, and 2 Bedrooms + Dens. Steps to Ryerson University, Eaton Centre, Dundas Square and The Subway, 365 Church will be another another life story coming soon to Church & Carlton. The project will be built by Menkes Development Inc.
365 Church Builder(s): Menkes Developments Ltd.